Despite initially feeling that Vienna wasn’t quite as nice as Munich, we have seen and done some lovely things here. We chose a hostel (Wombat’s) that is right next to the Nachtmarkt, markets that run along a long, wide median strip between two roads. It’s a bit less than a kilometre long and the stalls open from early morning to fairly late at night, except on Sundays. As an aside, we are quickly learning that being in European cities on a Sunday means few shops or anything else open so you have to plan your excursions and grocery shopping accordingly. 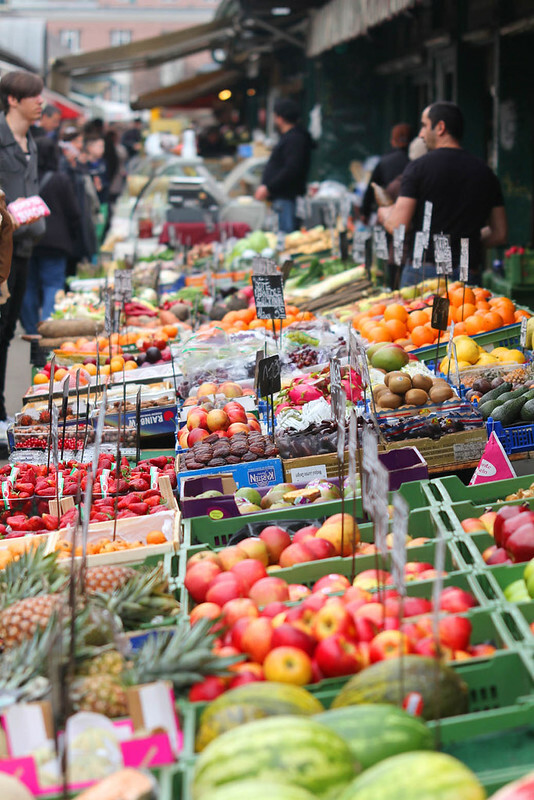 The markets have lots of great fresh food, although it’s worth doing a sweep up and down to find the best prices as they do vary a bit. We bought soup for breakfast yesterday – it was served inside a bread roll so all we needed was a spoon. Very environmentally friendly! We’re hoping the guy will be back there tomorrow so we can have it for breakfast again. This whole idea of serving hot food in bread rolls is definitely one I’ll be taking home with me. 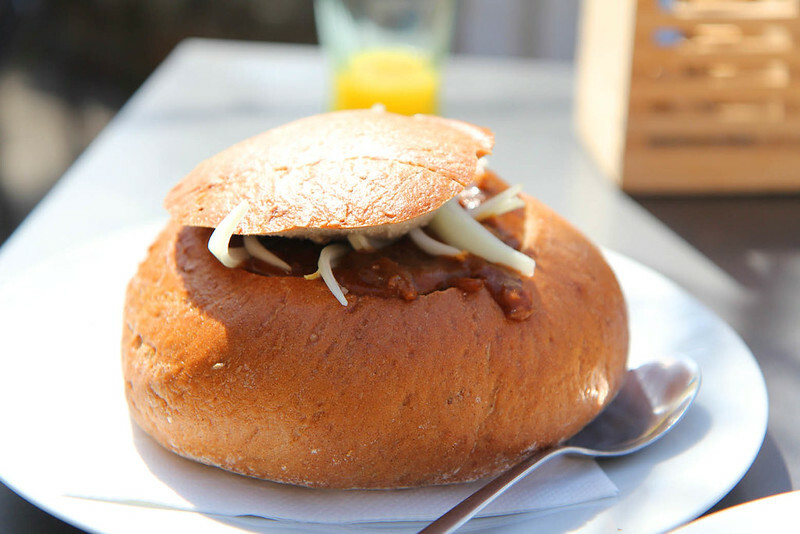 Gulash served in bread in Krumlov – I forgot to take a picture of the soup in bread in Vienna. I bought fresh pasta, pesto and vegetables to make into dinner last night. Even though hostel kitchens are always pretty basic the one here isn’t too bad and we ended up sharing our meal with another traveler, Alex, who started chatting to us in the kitchen. Yesterday we also did a walking tour of the city. It was pretty good, but nowhere near as good as the Munich tour. Nothing beats a tour guide who is funny as well as informative. There seem to be free walking tours everywhere in Europe. The idea is you tip the guide what you think the tour is worth at the end. Doing some sort of tour is a great way to start off in a new city – get one’s bearings and then have an idea of where to go back to. Although we did find Vienna mysteriously difficult to navigate and got lost a few times. We had trouble finding the Sacher Hotel one afternoon but eventually made it for a piece of the original (well, not *the* original) Sacher Torte. As one might expect, the place is filled almost exclusively with tourists, but the cake was really nice and the iced chocolate was even better. If I hadn’t been trying to moderate my calories somewhat we’d surely have found a few more places selling tortes in order to compare. One of the last things we did in Vienna was spend an evening at a coffee house – the Kafka Cafe, which several people I know (Anth, I’m looking at you) would’ve loved. Old leather booths, locals sitting around smoking and chatting, endless streams of coffee and beer – it was great. We got chatting to a local girl who’d spent time in Ireland and spoke perfect English with an Irish accent, which was slightly disconcerting. She assured us we’d found the best cafe in Vienna. Lucky us! Are bread bowls not a common thing in Oz? They’re pretty popular here for lots of hearty dishes (stews, thick cream soups, etc). I’ve only had food in bread a couple of times in my life previously… but it’ll be a lot more often after this! I loved hunting out local markets throughout Europe – so many colours and weird and wonderful foods! Eastern Europe in particular was great for them, and these countries also tended to have the best hostel kitchens in my experience. I love a good market! I think it’s one of my favourite things to do. We’ll probably head to the market hall here tomorrow.